I got to hold her for about 10 minutes before she started to desat, and again, right before they intubated, I helped myself and held her without asking for a few seconds… but her body was pretty limp because she was so exhausted from the work of breathing. I’m just…. here. And just very sad. And frustrated. And a wee bit deflated. Part of me wants to say a really big I TOLD YOU SO, as I really didn’t feel that she was ready. A part of me, maybe the pessimistic part, or maybe it was the Mommy part, knew that this wasn’t going to be “the time” for her to stay extubated. Oh, I wanted it to be. REALLY badly. 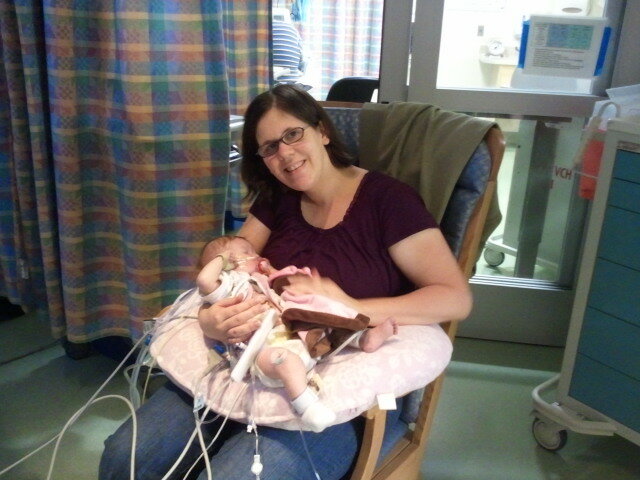 But it’d only been a good day or so of doing well on longer CPAP trials while on the vent. I really thought she needed more exercize. They also wanted to extubate her to minimal O2 settings (instead of a CPAP machine) and I really didn’t like that idea since she’d done so badly on it before. Maybe it was just my jaded thinking from all her previous fails. But the Doctor’s thinking was, with her new heart anatomy, she’d do awesome this time. So now we are back to starting from scratch. Rechecking everything. 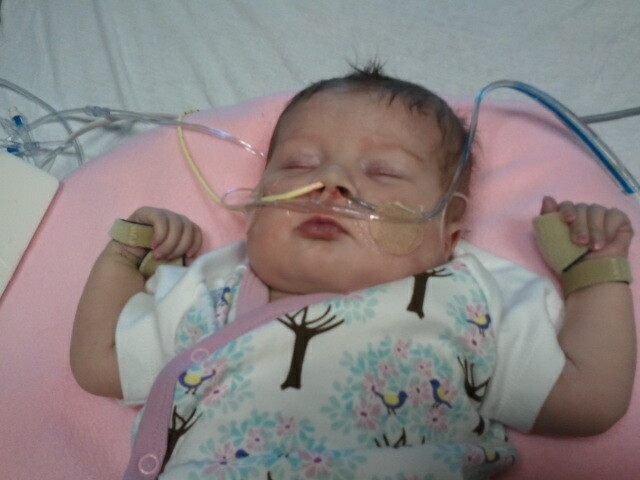 Trying to figure out how to get her off the ventilator. I’m just really tired. I really really am. But then… another little baby here didn’t make it today. My heart is breaking for his parents. On one hand, I am so very thankful my Annabelle is still here. But on the other, it scares me like crazy. Would God make us go through this process for all this time and still take our Annabelle away? The answer, of course, is a resounding maybe. So, I pray. I beg God. I make it one more day… a day at a time. God knows and He hears. There is a reason for this too. I’m choosing to be okay with not knowing what that reason is. Here are a few pics from the brief shining moments of our day. Krista, okay, well, I'm not even sure what to say. I have been so out of the loop that I have missed your trial altogether. So imagine my shock to come visiting and see, for the first time, your precious daughter, and to realize you've been through a horrendous journey. I am so glad I wandered over here today, though I know I am really late. But not too late for a ton of prayers. Oh, you are such a brave mama. You are going to get through this! She's so beautiful, and I'm so sorry this has been a cross you've had to bear. Please know of my fresh, steadfast prayers, Krista! Peace be with you and your dear family! Oh Krista, I'm so sorry. I can't imagine that kind of pain with the ups and downs gets any easier to take. And of course I can't see behind the blog, but it does seem like you're coping extremely well. Praying for the True Peace to get you through tonight. Praying God holds you. 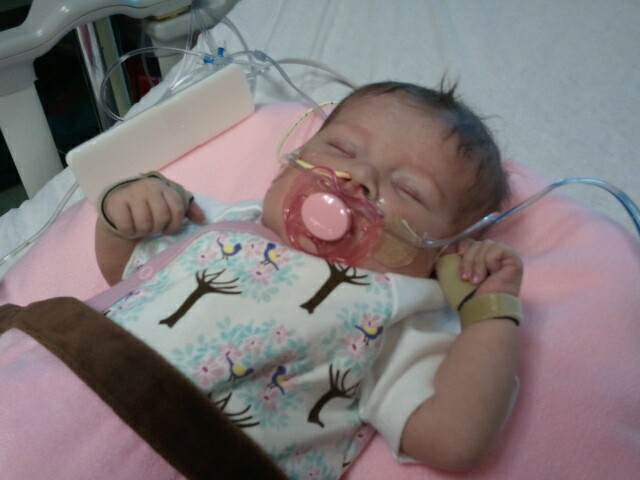 Praying God holds Annabelle. Praying for peace and comfort and His protection upon this little one. My heart is literally breaking for you. Lord, I pray you give strength to Krista and her family. I pray you sustain her through this and birth a new hope inside her. You say, "See I'm doing a new thing" in your word. I pray you do a new thing here. Praying for you and leaving you with the hope of this verse. "For I know the plans I have for you," declares the LORD, "plans to prosper you and not to harm you, plans to give you hope and a future." I don't even know what to say or any answer to our questions "why?" All I am sure of is that His wisdom exceeds ours. He is not asleep in this storm. Praying for Annabelle, her medical team, you and your family. Trusting in our Lord, the Great Physician. My heart aches for you and your little Annabelle. I know the roller coaster of long, challenging hospital stays but your ride has lasted longer than most with more "ups and downs" it seems. Just remember God hasn't forgotten you. He loves you all so much. Thank you everyone for your thoughts and prayers. I can not express how much they help lift me up and encourage me. Thank you, from the bottom of my heart! Sherrinda – God HAS blessed me more than I deserve. Thank you for the reminder!!! Roxane – It's been a long journey, that is for sure! Fresh prayers are always good!!! Wendy – Thanks:-) I probably come off sounding a *little* better in words than I do to those here hearing me ball my eyes out last night… but I serve a really big God who takes care of me, so I AM doing okay. Not great, but okay. Katie – Thank you. Prayers are SO SO very appreciated! Wendy M – Yes, those ten minutes were worth all of the pain of the day. Darlene – Yes, the Why question is one that is rarely answered. I don't think GOd minds when we ask, but sometimes he just holds us and says, "It'll be okay." Keli – Yes, God IS the great physician. We're praying he comes whispers some words of wisdom into the ears of our earthly doctors! Tammi – Thanks so much for your prayers! I know you are well aware of this strange, crazy roller coaster. But our precious heart babies are worth it! Krista, I am sorry. The ups and downs can wear a mama out. I am praying for you and Annabelle, and for wisdom for her doctors. I am glad you got to hold her yesterday. I know that was good for both of you. Oh Krista, I'm so sorry. I know I don't comment as much as I should on here, but I am reading your posts and truly thinking of all of you and what you're going through. I am praying so very hard. This is in God's hands, we have to believe that He knows what He's doing even though it may not seem like it. The road can be scary, but this is making you all so much stronger. Hang in there, Krista! Hope you have a restful, peace-filled night. Prayers are in abundance for your precious angel and your entire family. Love you lots!!! I follow you on Twitter & saw that the doctors rounds were frustrating today. It's something I can relate to very well. You're in great hands at Vandy but in even greater hands with God. I just wanted to stop by and say that it's okay to be tired. Just because you are a "Mom" does not give you super powers. Thankfully you know the One Who has all power. When we are weak, He's is at full strength. It is my prayer that His power will be evident in your life today–in undeniably obvious ways. I'm also joining the many other people praying that God will touch Annabelle with His healing power. May God hold you all very close as you navigate through this trial. So sorry for all you are enduring at this time. But you are strong and God will lift you up. I'm praying for that 10 minutes to stretch into a lifetime of precious moments. Praying for your whole family! A Mom, a family member, often have an instinct that doctors don't have about these things. I went through that with my husband when he was sick. In serious situations, there are highs and lows. We're all praying for you, Scott, and Annabelle.